In the US, guns, rifles, other firearms, and ammunition are not allowed in the passenger cabin, but the TSA does allow passengers to fly firearms and some kinds of ammunition in checked baggage so long as they follow a few basic rules. As discussed in detail on AirSafe.com, pistols, flare guns, BB guns, rifles, and other firearms are allowed in checked luggage, but must be unloaded, packed in a locked hard-sided container, and declared to the airline at check-in. This restriction also applies to firearms parts and ammunition. When passengers check in, they are required to declare the items with the airline and ensure they are packed properly. TSA has no role in the declaration process. However,if the TSA searches your checked bag and finds weapons or ammunition that have not been properly declared or packed, they will have to notify a law enforcement officer and an airline representative. Depending on the local or state laws, you may be fined or even arrested. You must declare all firearms to the airline during the ticket counter check-in process. The container must be locked. A locked container is defined as one that completely secures the firearm from access by anyone other than you. Cases that can be pulled open with little effort do not meet this criterion. These pictures provided here illustrate the difference between a properly packaged and an improperly packaged firearm. TSA recommends that you provide the key or combination to the security officer if he or she needs to open the container. You should remain in the area designated by the aircraft operator or TSA representative to take the key back after the container is cleared for transportation. If you are not present and the security officer must open the container, TSA or the airline will make a reasonable attempt to contact you. If they can't contact you, the container will not be placed on the plane. 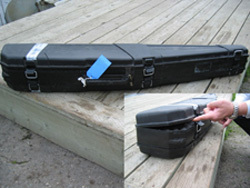 Federal regulations prohibit unlocked gun cases (or cases with broken locks) on aircraft. You must securely pack any ammunition in fiber (such as cardboard), wood or metal boxes or other packaging that is specifically designed to carry small amounts of ammunition (the TSA does not specifically say how much is a "small amount"). You can't bring black powder or percussion caps used with black-powder type firearms in either your carry-on or checked baggage. The TSA bans realistic replicas of firearms from the passenger cabin, including carry-on baggage, but the definition of a realistic firearm replica is up to the interpretation of the TSA. 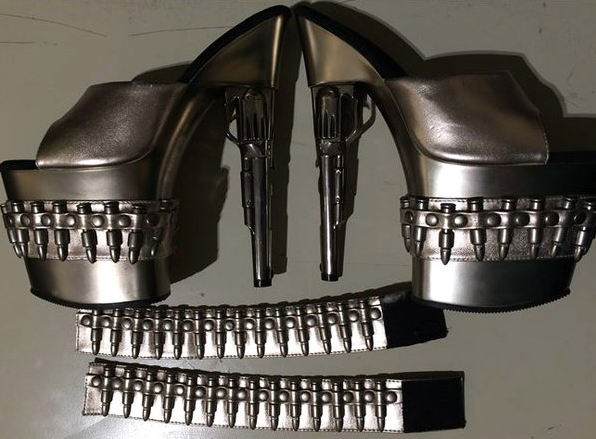 For example, a pair of high-heeled stiletto shoes and matching bracelets that have heels shaped like pistols and simulated bullets as part of the design may be clearly intended to be a bizarre, though non-threatening, fashion choice, yet on at least one occasion a TSA representative confiscated these items from a passenger's carry-on bag. The TSA apparently makes no clear distinction between replicas, such as toys, that are clearly intended to look like a realistic firearm, and fashion accessories. The details provided on this page refer to domestic flights within the US. When traveling to or from the US, or when traveling between any two countries, you must understand the laws of your departure country, your destination country, and of any country where you may change planes or have any kind of layover. In addition to the laws about possessing and using firearms and ammunition, you should take the time to find out if there are any import and export taxes or fees associated with taking firearms and ammunition into or out of any country.